On a tropical island vacation, one of the last things you want to worry about is food poisoning. Yet for many, a trip to the tropics includes a painful education in a mysterious food-borne illness called Ciguatera Fish Poisoning, or CFP. Every year, thousands of people suffer from CFP, a poisoning syndrome caused by eating toxic reef fish. CFP symptoms are both gastrointestinal and neurological, bringing on bouts of nausea, vomiting, diarrhea, headaches, muscle aches, and in some cases, the reversal of hot and cold sensations. Some neurological symptoms can persist for days to months to years after exposure. There is no quick way to test for the toxins, and unless action is taken within hours of the poisoning, no cure once you’re sick. On some small islands in the Caribbean and South Pacific, it’s estimated that CFP can affect more than 50 percent of the population. Ciguatera runs like an undercurrent through these communities, not always visible at the surface but having vast economic and public health impacts. CFP is consistently underreported because of both misdiagnosis and a reluctance of local people to go to the hospital or local clinic when sick. That’s why I’m here in St. Thomas, diving in water the color of an unclouded sky for a near-invisible quarry. Amidst the coral and seaweeds, fish appear like bright flashes in the shadows and light. They tear and scrape food from the algae and dead corals. I reach down and enclose some seaweed in a plastic bag, collecting not only the seaweed, but also thousands of tiny hitchhikers. I’m hoping to find elusive cells sticking to that seaweed. 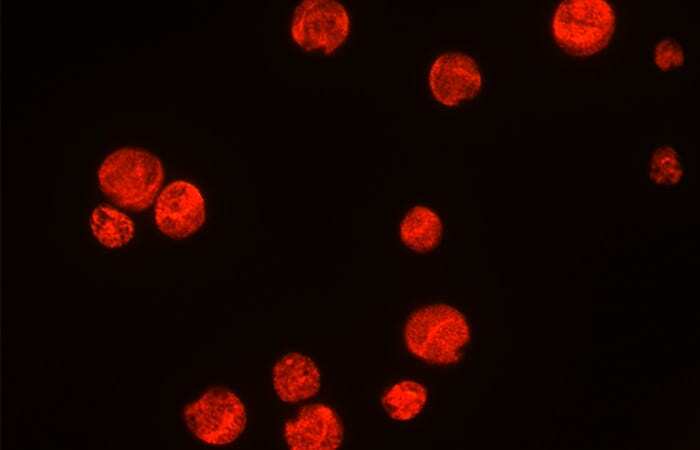 These microscopic cells, called Gambierdiscus, produce the toxins that cause CFP. By learning more about their genetics, I hope to find out how they grow in different environments and how that affects the risk of CFP around the globe. Gambierdiscus likes warm water. It’s a tropical dinoflagellate, which is a type of phytoplankton. Phytoplankton use photosynthesis, harnessing the sun’s energy to make food. They are named plankton because they “drift” through the world’s oceans. However, this can be misleading since dinoflagellates, as implied in their name, possess two flagella—whiplike appendages that they use to make small movements in their underwater environment. Gambierdiscus lead a benthic existence, attaching themselves to seaweed, sand, and dead coral on the ocean floor. When herbivorous, or plant-eating, fish bite or scrape seaweed to feed, they also coincidentally consume many Gambierdiscus cells. The toxins in those cells accumulate in the fish. Gambiertoxins produced by Gambierdiscus are biotransformed by fish into ciguatoxins, which can cause disease in humans. Ciguatoxins can accumulate not only in fish that directly eat Gambierdiscus cells, but also in the predators that eat those fish. 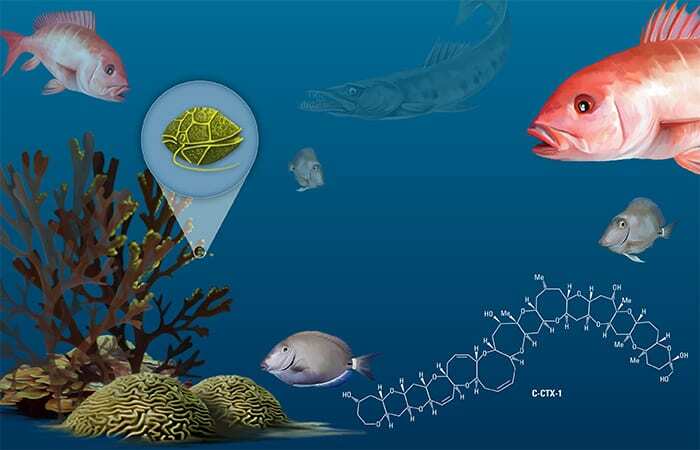 When carnivorous fish consume toxic herbivorous fish, the toxins can accumulate in them as well, allowing the toxins to biomagnify up the tropical coral reef food chain. By the time a barracuda, snapper, or grouper is caught on a fishing line, it often has levels of toxin many times higher than the herbivorous fish they consumed. Currently there is no reliable, quick test for ciguatera toxicity in fish, and heat from cooking doesn’t inactivate the toxins. Consumers must rely on the trustworthiness of fishermen and their knowledge of local CFP risk. Fishermen generally have learned which locations and which fish are likely to be safe for consumption through long experience of catching, selling, and hearing back from customers about which fish made them sick. Often a certain region or side of an island will be more toxic than another because of differences in winds and water turbulence. Certain reef fish species do tend to settle and stay in the same place for their whole adult life, and choosing these “homebodies” to fish offers a better chance of avoiding a toxic catch. But the problem is that fish don’t necessarily stay in one place, and even a fish caught in a safe area could have just traveled from a prime Gambierdiscus habitat. Low levels of ciguatoxins probably permeate the entire tropical food web, so that even if people avoid high-risk fish, they can still consume low levels of toxin. Unfortunately, even if a fish isn’t toxic enough to make you sick in one sitting, eating fish with low levels of toxin can lead to chronic effects that are still largely unknown. If a patient is able to get to the hospital soon after they have consumed a poisonous fish, they may be given an intravenous dose of mannitol, a drug that greatly alleviates the symptoms of CFP. However, after a certain period of time, mannitol has no effect. Locals also use several herbal and traditional folk remedies, but these have not been scientifically proven effective. Understanding the ecology and growth patterns of Gambierdiscus species can help us predict a region’s potential risk of CFP. As water temperatures increase because of global warming, Gambierdiscus’ range has expanded to new environments—from the Caribbean, for example, to the Gulf of Mexico and up the coast of Florida. But it also may be diminishing in other areas if temperatures rise higher than Gambierdiscus’ growth threshold. Furthermore, coral reefs are declining, creating environments that allow seaweeds to take over corals—and providing perfect habitats for Gambierdiscus. Corals are being damaged in many ways: physically, chemically, and biologically. They are torn up by ship anchors, damaged by blast fishing techniques, suffocated by sedimentation, or bleached by high temperatures. They are affected by pollution and acidification of the world’s oceans, and they are harmed by overfishing and marine diseases. A trend toward warmer, more seaweed-rich environments may drastically change the map of CFP risk, potentially introducing CFP to new regions and jeopardizing the current method of using fishing histories to find safe catch locations. Back on the beach, I process the samples I’ve collected. Brown gunk settles to the top of the filter’s membrane. “This is going to be good,” I think, as I admire its muddy color and viscous consistency. Careful not to lose any of the sample, I wash the soupy mess into a plastic tube, sealing it tight and packing it away from the hot sun. I’ve just captured the benthic community living on the surface of a collection of seaweeds. Many different types of cells inhabit the algae’s surface, but I’m most interested in which species of Gambierdiscus are there. There are more than ten different species within the genus Gambierdiscus. Most are impossible to distinguish from one another under the light microscope. However, these species can vary widely in their production of toxin and their optimum growth conditions. Distinguishing among these species can help us determine the overall toxicity present in a location. A high abundance of cells with low toxicity may mean the same risk of CFP to local populations as a lower abundance of highly toxic cells. Furthermore, by identifying different species, we can see if they respond differently to changes in their environment. As overall temperatures increase and natural conditions change, one species may be favored over another, affecting the amount of toxin on a reef. I am developing a way to apply fluorescent labels to different species of Gambierdiscus based on their genetic code, using a technique called fluorescence in situ hybridization, or FISH. FISH probes use synthetic DNA probes with genetic sequences tailored to pair specifically with the genetic material in cells of individual species. These probes also have an attached fluorophore, a chemical compound that glows under certain wavelengths of light. 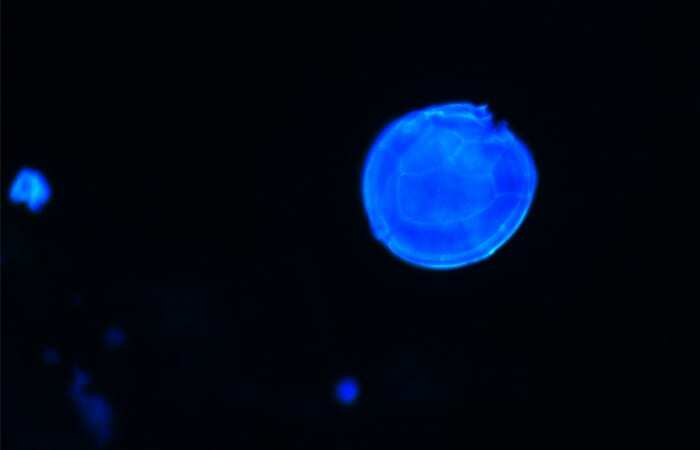 In this way, we can target species of Gambierdiscus by their particular genetic sequences and identify them in samples using a fluorescence microscope. This technique will help us to identify and enumerate the different Gambierdiscus species in the environment. We can then look at how the community of Gambierdiscus changes over time and in different locations. Since Gambierdiscus lives on a variety of substrates, from seaweed to dead coral rubble, it’s difficult to measure how many cells are in a specific location. A big research question is how the abundance of Gambierdiscus changes over the year and if we can link these changes to the timing of illness in humans. Traditionally, researchers have used the number of cells per gram wet weight of seaweed to quantify Gambierdiscus densities. This measurement is used to compare the abundance of Gambierdiscus over time and between locations. Unfortunately, the relationship between cells and the host seaweed is complicated: The abundance of seaweed can vary seasonally, and not all seaweeds are equally good hosts. An important question has emerged from the research: How has this variability affected estimates of Gambierdiscus’ abundance over time? If there is less seaweed, does the same number of Gambierdiscus cells just pile on the seaweed surface in a more crowded configuration, or do the toxic cells move to another substrate in the environment? Furthermore, Gambierdiscus can be choosy in where it likes to live. Different species of Gambierdiscus prefer to live on different species of seaweed. The picture gets complicated, so recently we have tried using artificial substrates to get around these difficulties. We deployed small ceramic tiles under water for month-long periods. Gambierdiscus settle on these tiles, and when we harvest them, we can record their abundance and density. This way, we have a standard surface area to sample, and Gambierdiscus’ habitat preferences don’t bias the results. Ideally, we hope to obtain a more balanced view of what species are abundant in the environment at any given time. Back in the lab at the Woods Hole Oceanographic Institution, I look at my filtered field samples under the microscope, searching for the characteristic Gambierdiscus cells, which look like little brown UFOs flitting about amid the muck. 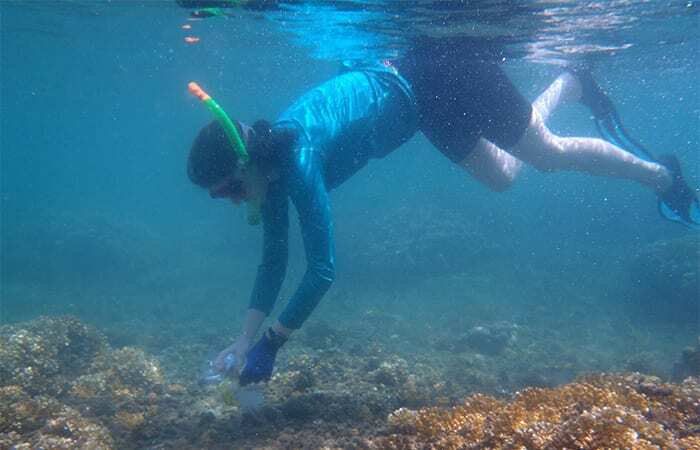 Taking a glass pipette, I carefully reach in to pick up a cell, chasing it around the slide and finally cornering it behind a green blob of sloughed-off seaweed cells and bacteria. Somewhat reluctantly, the cell releases its hold on the slide’s surface, and I happily place it into a well inside a plastic plate filled with filtered seawater. I’ll give this cell light and food, letting it multiply and provide me with another culture of cells to use to investigate the genetic diversity of Gambierdiscus. 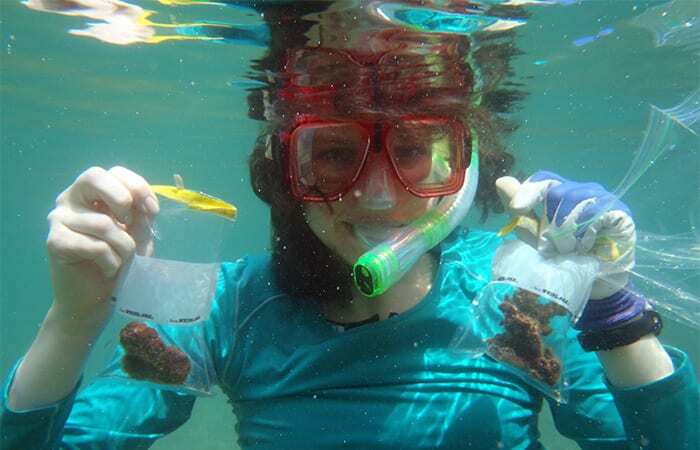 Funding for this research was provided by the U.S. Food and Drug Administration, the National Oceanic and Atmospheric Administration, the National Science Foundation, and the National Institutes of Environmental Health Science through the Woods Hole Center for Oceans and Human Health.